I’d go as far as saying it’s the best sounding Alexa speaker of its size. Alexa speakers are becoming commonplace. 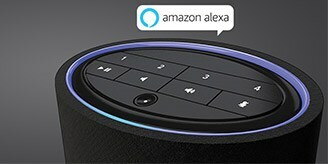 Amazon has their own array of speakers and various manufacturers are using the Alexa service to market their own wares. 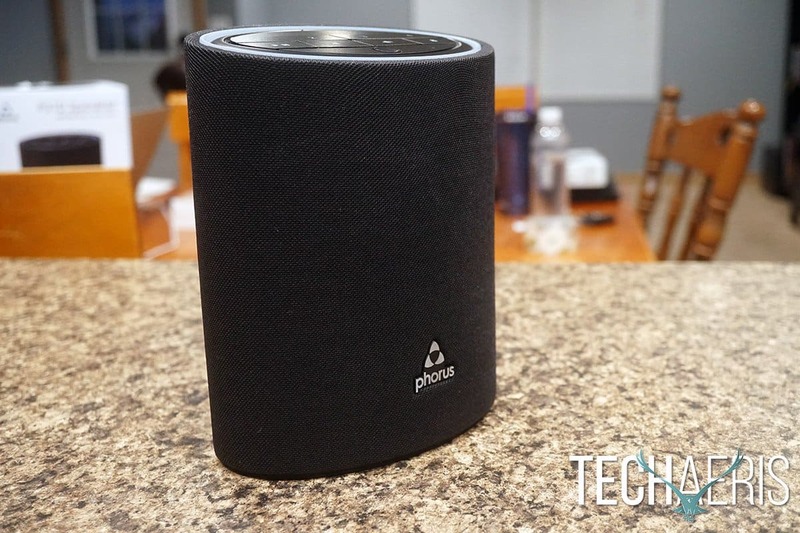 While we’ve not tested every Alexa speaker out there, I’m comfortable in saying, the Phorus PS10 is easily one of the best out there. 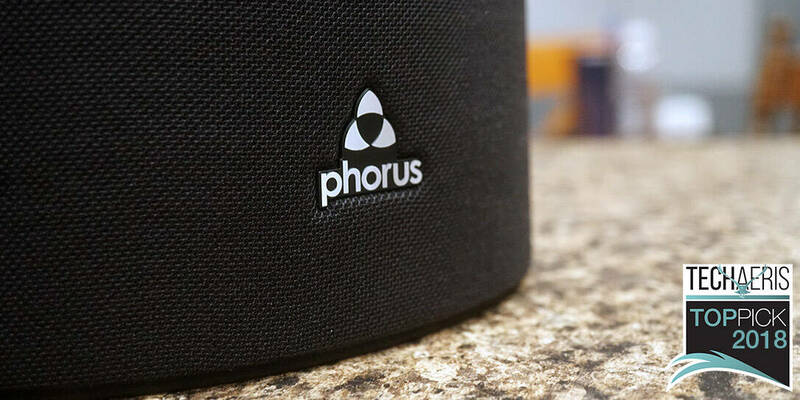 Some of you may not be familiar with Phorus but we’ve tested several of their speakers. Phorus has always delivered some excellent sound and the Phorus PS10 is no exception. Read on for the full Phorus PS10 review. Aesthetic design is going to be a subjective thing for everyone. For me, the Phorus PS10 is easily the nicest looking Alexa speaker out there. The build quality is top notch and the materials used are premium. I particularly like the light ring at the top which indicates volume and activates when speaking to Alexa. Now, that’s also not unique, it’s been done on other speakers. But I like the shape and the way Phorus implemented their version. There’s not much to the speaker as far as controls. There are 4 preset buttons at the top which you can use to store your favorite streaming stations too. Then there is the play/pause button, volume up/down button, and mute microphone button. The mute button allows you to mute the mics so Alexa won’t be listening, in case you’re wanting some privacy. The far-field mics are also at the top and that’s what allows you to be able to give Alexa commands from a distance. Around the back you have the power button, WPS button, reset button, MicroUSB input, USB input, AUX in, and AUX out. Overall, this is easily the best looking Alexa speaker I’ve used or tested to date. This even beats the Amazon Echo and not just in design, but we’ll get more into sound later. 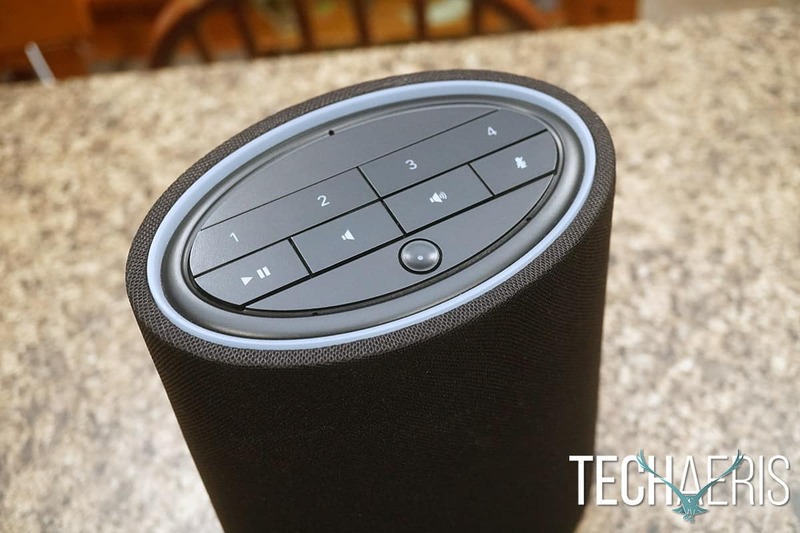 Most smart speakers are pretty simple to set up and use these days. Some connect over Bluetooth and some connect over Wi-Fi. The Phorus PS10 will ask you to connect using Wi-Fi when you open the Phorus app. What happens is, you connect to the PS10’s Wi-Fi connection and then give the PS10 your Wi-Fi password so it can connect to your network. It’s all pretty simple and once it’s done, you’re ready to roll. 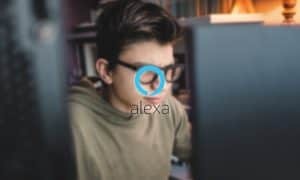 Of course, if you want to use Alexa and its skills, you’ll need to connect your Amazon account to the app. You can add Alexa skills to your Amazon account and those skills will work across any Alexa speakers connected to that account. The Phorus app is fairly straightforward and easy to use. Here you can choose what music services you want to use with your Phorus PS10, create speaker groups, add Spotify groups, pair DTS speakers, activate surround sound, turn Alexa on or off, along with various other settings. Overall, this is a simple speaker to use and the app is straightforward and once you’re set up you really only need to check for updates here and there. Alexa is, well, Alexa. There are new skills always being added and some of them are useful and others just fun. 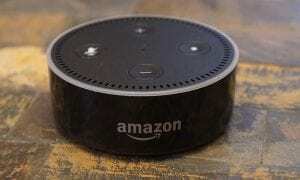 Alexa is going to be most useful for those who have Amazon accounts and smart devices that can be controlled by it. Of course, she’s useful for telling you weather and basic information, most AI’s can handle all of that. What Amazon wants is for you to connect to their ecosystem and purchase everything from them. Which isn’t unusual as Apple and Google want them same thing. Overall, Alexa is useful for many things and can be fun to use. It’s not for everyone and I prefer Google Assistant but it’s nice to mix up the AI’s in the house. Alexa and Assistant live together here. Phorus has always done sound really well and are very proud to be using DTS Play-Fi technology. The Phorus PS10 is no different, it’s absolutely great! I’d go as far as saying it’s the best sounding Alexa speaker of its size. Everything is well balanced with just a hint of extra bass but only enough to make things sound solid. 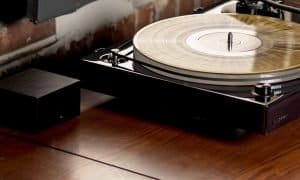 The Phorus PS10 wireless speaker produces its audio, through a built-in 30-watt Class D amplifier with DTS Sound processing, two 65mm neodymium full range transducers, and dual passive radiators. I didn’t get any distortion or cracking at high volumes and I found the sound to be pleasant, full, and accurate. 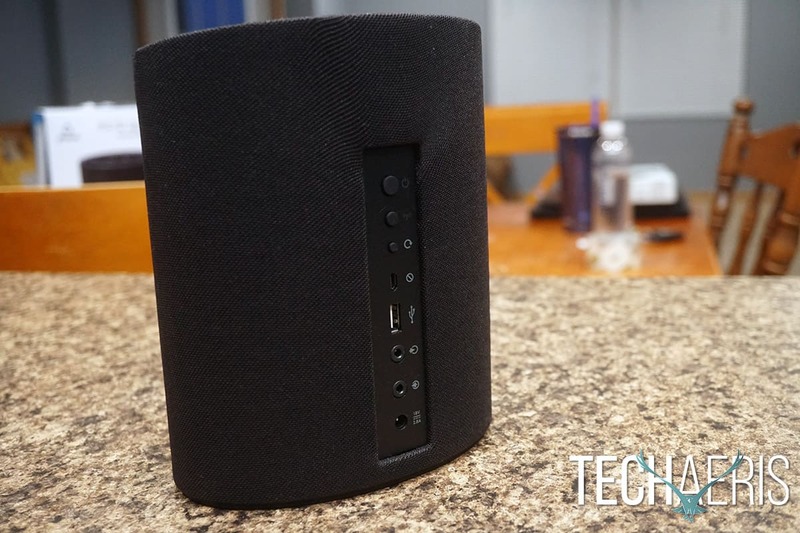 Overall, I believe this is the best sounding Alexa speaker yet. The Phorus PS10 retails for $249USD on the Phorus site. But as of this review, you can pick this up on Amazon for an insane $99USD. I think there’s plenty of value at the $249USD price but at the $99USD price, it’s a steal. 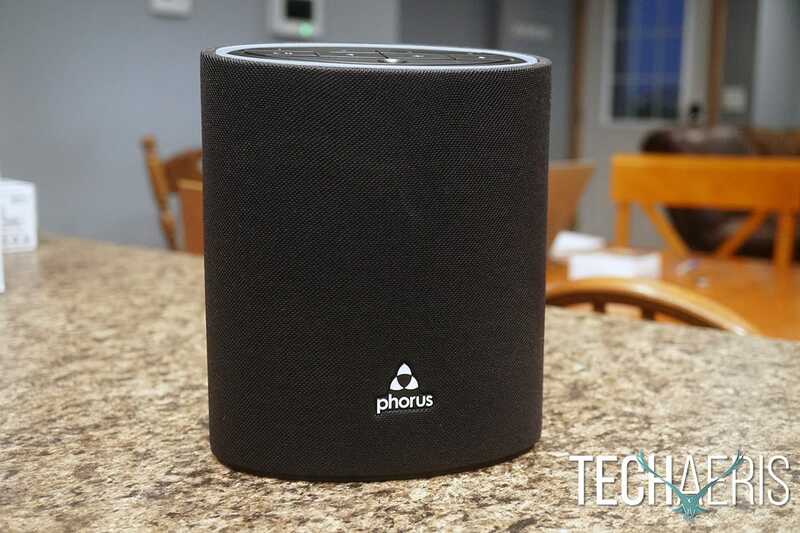 The Phorus PS10 is an outstanding Alexa speaker. Perhaps Amazon should have hit them up to engineer and make their own Amazon Echo speakers. 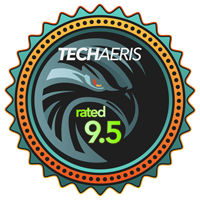 *We received a sample of the Phorus PS10 for the purposes of this review.